Flame Arrow 1/3 No need to go further with this skill. It's your default skill. It increases your magical damage upon hit as a buff. Rapid Blasts 5/5Max this, it will be your main damage skill. Ice arrow 1/3 Pulling tool and a buff skill for your spells to cast faster upon hit. Ice Thorns 1/5 Sub zero effect combine with Cold wave freezes your target. Pre-req for Ice Barrier which is easier to freeze enemies. Magic mastery 5/5 Increases overall all your magic spell's damage. Divine Punishment 1/5 Another spell to use for close combat to flinch enemies. Revitalize 1/3 A healing spell that could be useful in PvE and PvP. Flame Impact 5/5 Max this to combo with Rapid Blasts. Meditation 1/3 You run out of EP, using lv 1 on it to recover it back. Flame orb 1/3 Leave it at 1 to unlock meteor. Use this only to knockback enemies. Ice orb 1/3 Same thing goes here to unlock Cold Wave. Use this to slow enemies. Ice Barrier 1/5 Lv 1 is enough to freeze enemies with Cold Wave combo. Cold Wave 1/5 Lv 1 is enough to cause freeze effect on target with Sub Zero effect. A good crowd controll skill. Crystallization 1/1 This is Sorcerer's evasive skill, max it for PvE and PvP usage by freezing enemies within range/radius. 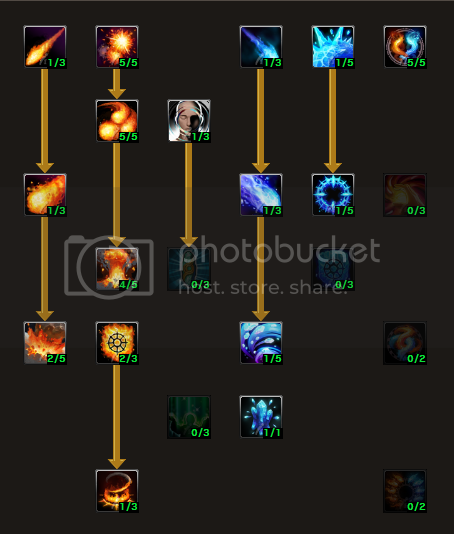 Flame Tornado 1/3 Unblockable skill which is AoE effect. You can cast another spell while this is active. This may look like you are teleporting in PvP. Removed - -1 Wisdom, -3 Inticracy, -2 Elemental Harmony, -2 Imbalance. Added - +3 Rapid Blasts, +1 Flame Impact, +1 Meditation, +3 Pillar of Fire. 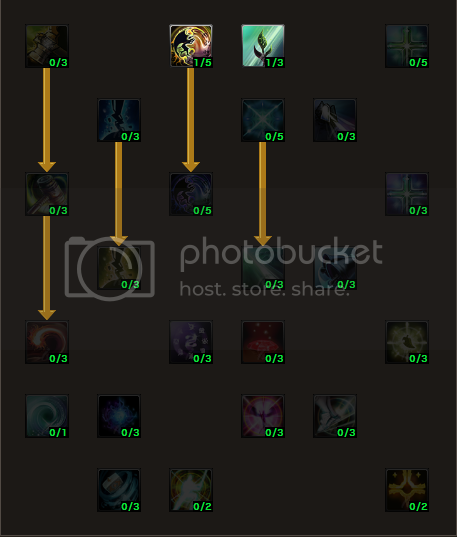 Reasons - After reading Abbadonxk's opinion, I decided to drop 3 out of 4 passives skills, added up to lower cooldown on my main skills. I even removed the Wisdom skill because I'm focusing on damage and not on crit.